GAO-14-478T: Published: Apr 8, 2014. Publicly Released: Apr 8, 2014. 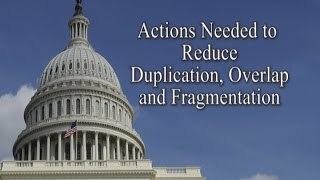 In his April 8, 2014, testimony to the U.S. House of Representatives, Comptroller General Gene Dodaro provides an overview of GAO's 2014 Annual Report on opportunities to reduce fragmentation, overlap, and duplication and achieve other financial benefits for the federal government. He also follows up on progress from past Annual Reports. GAO's 2014 annual report identifies 64 new actions that executive branch agencies and Congress could take to improve the efficiency and effectiveness of 26 areas of government. GAO identifies 11 new areas in which there is evidence of fragmentation, overlap, or duplication. For example, under current law, individuals are allowed to receive concurrent payments from the Disability Insurance and Unemployment programs. Eliminating the overlap in these payments could save the government about $1.2 billion over the next 10 years. GAO also identifies 15 new areas where opportunities exist either to reduce the cost of government operations or enhance revenue collections. For example, Congress could rescind all or part of the remaining $4.2 billion in credit subsidies for the Advanced Technology Vehicles Manufacturing Loan program unless the Department of Energy demonstrates sufficient demand for this funding. The executive branch and Congress have made progress in addressing the approximately 380 actions across 162 areas that GAO identified in its past annual reports. As of March 6, 2014, the date GAO completed its progress update audit work, nearly 20 percent of these areas were addressed, over 60 percent were partially addressed, and about 15 percent were not addressed, as shown in the figure below. Executive branch and congressional efforts to address these and other actions over the past 3 years have resulted in over $10 billion in cost savings with billions of dollars more in cost savings anticipated in future years. Better data and a greater focus on outcomes are essential to improving the efficiency and effectiveness of federal efforts. Currently, there is not a comprehensive list of all federal programs and agencies often lack reliable budgetary and performance information about their own programs. Without knowing the scope, cost, or performance of programs, it is difficult for executive branch agencies or Congress to gauge the magnitude of the federal commitment to a particular area of activity or the extent to which associated federal programs are effectively and efficiently achieving shared goals. As the fiscal pressures facing the government continue, so too does the need for executive branch agencies and Congress to improve the efficiency and effectiveness of government programs and activities. Opportunities to take action exist in areas where federal programs or activities are fragmented, overlapping, or duplicative. To highlight these challenges and to inform government decision makers on actions that could be taken to address them, GAO is statutorily required to identify and report annually to Congress on federal programs, agencies, offices, and initiatives, both within departments and government-wide, which have duplicative goals or activities. GAO has also identified additional opportunities to achieve greater efficiency and effectiveness by means of cost savings or enhanced revenue collection. This statement discusses the (1) new areas identified in GAO's 2014 annual report; (2) status of actions taken by the administration and Congress to address the 162 areas previously identified in GAO's 2011, 2012 and 2013 annual reports; and (3) opportunities to address the issues GAO identified. To identify what actions exist to address these issues and take advantage of opportunities for cost savings and enhanced revenues, GAO reviewed and updated prior work and recommendations for consideration.